Spice is nice! We’ll go further than that and say spice is vital.Spices have always played an important part in food preparation. Before we had fridges spices helped to preserve food; and many have been acclaimed for their medicinal purposes. But most importantly, as far as we’re concerned, spices are important for the flavour, aroma and colour they add to our food. Spices can come from seeds, flowers, bark, roots and fruit; the one thing they have is common is that they bring something special to our cookery. Spices can be kept in airtight containers in a cool dark cupboard for 6 months (ground) or 12 months (whole). If you’re like us, you’ll have a shelf full of glass jars of spices. You’ll have opened them, used a spoonful and … that’s it. At least once a year it’s a good idea to have a clearout. Throw out any that have passed their best-by date, or have lost their smell. If you can buy whole spices and grind them yourself when you need them, you’ll be adding a much fresher flavour to your food. Use a pestle and mortar or a small coffee grinder – but reserve it for spice use if you don’t want strange tasting coffee! 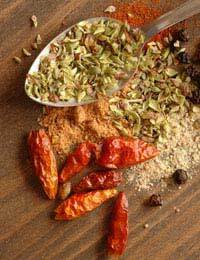 Some experts recommend toasting spices before grinding to further enhance the flavour. Place the seeds in a small dry saucepan and shake over a low heat until lightly toasted. It won’t take long. Allow to cool before grinding.And when you buy spices, look for the smallest quantities you can find. Better to buy little and often. You’ll be familiar with most of the spices that are used in Asian cookery but here are a few ingredients that might be a little less familiar. Has a gingery lemon flavour. Rather like spring onion in appearance, it can be used whole or in slices. If using whole, remove the top leafy bits and then bash the bulb to release the aromatic oils. It goes particularly well with coconut milk, chicken and seafood. Wrapped in a paper bag it will last for 2-3 weeks in the fridge or you can freeze it. Make sure it’s well-wrapped if you don’t want everything in your fridge to smell of lemon. Similar in appearance to root ginger, this rhizome has a camphorous gingery smell and a pungent flavour. Use it like ginger in curries or in fish or shellfish recipes. In India it’s been used both as a halitosis remedy and an aphrodisiac. The gum exuded by the root of the herb, Ferula, it’s high in sulphur and smells very bad! Fortunately this smell dissipates during cooking leaving a garlicky-onion taste. It’s been used in India for curries and pickles, and for medicinal purposes for a very long time. Members of the Brahmin and Jain castes are forbidden to eat onions or garlic so the addition of asafoetida to their food provides an alternative source of flavour. Use in minute quantities. Comes in bark or bud form. The bark is similar to cinnamon and is often sold as the same. The buds are dried unripe fruit; they look a little like cloves. Both bud and bark have a warm, sweet spicy taste. The bark is very hard – almost impossible to crush – and is used whole in dishes and removed before serving. If your recipe specifies ground cassia it’s better to buy it ready-ground. While cinnamon is used primarily for sweet dishes, cassia adds a familiar warmth to robust main dishes. Cassia is a constituent of Chinese 5 spice mix.